Your genes are partly responsible for whether you’re a morning person or a night owl. 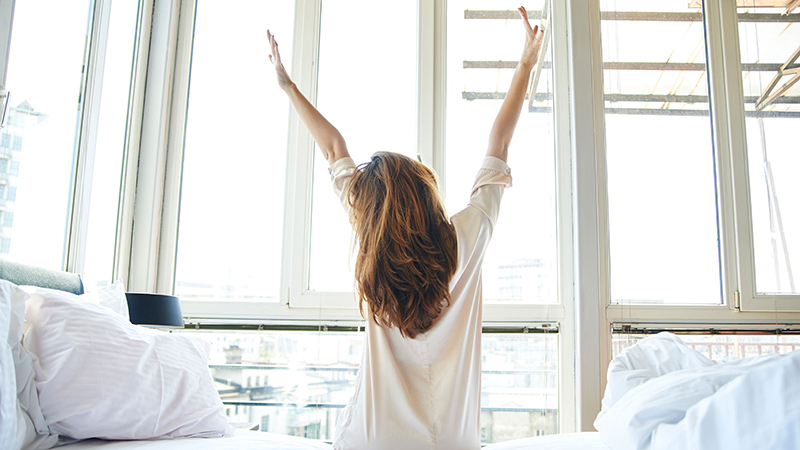 Research shows that being a morning person is associated with lots of health benefits. It’s been linked to better sleep, sustained weight loss, and more happiness. Maybe you’re a morning person. Maybe you’re a night owl who thinks morning people are eerily chipper. Either way, your preferred sleeping and waking pattern is hardwired into you. That personal tendency to be a morning person, a night owl, or something in between is called a chronotype — and science shows it’s partly controlled by your genetics. 1. You might be happier. A 2012 study in “Emotion” found that a tendency to wake up earlier — what scientists sometimes call “morningness” — was linked with higher self-reported happiness. As is the case with lots of research on chronotype, this study didn’t establish that waking up earlier causes people to be happier — it’s only a correlation. But it’s still fascinating. The paper’s authors speculated that early sunlight exposure might have an affect on mood. Morning people might also benefit because they’re at their most alert exactly when societal demands, like work, require them to be. 2. You might weigh less. Last year, genetic testing company 23andMe studied nearly 90,000 people who have used its tests as a way to investigate which genes influence chronotype. Their analysis, published in the journal “Nature Communications,” also found that being an early bird was linked with having a lower body mass index, or BMI. Similarly, a small 2014 study found that people who were exposed to sunlight earlier in the day had lower BMIs. 3. And you might be better at keeping weight off. 4. You might sleep better. Speaking of sleep: That same massive study conducted by 23andMe also found that only about 20% of self-identified morning people suffered from insomnia, compared to nearly 40% of night owls. 5. You might have better mental health. Among adolescents, having a later chronotype is associated with depression or depressive symptoms, according to a 2016 review of existing evidence. A 2015 study also found this link in a group nearly 2,000 people aged 18 through 65. But, again, these are just a correlations. Even though this link has been shown in lots of studies, it doesn’t mean that being a night owl causes depression, or that being a morning person will necessarily prevent it. 6. You might lower your risk for diabetes and metabolic syndrome. In a study of middle-aged Koreans, late risers were more likely to have diabetes and metabolic syndrome than early risers. That’s the name for a group of risk factors (including high blood pressure and high triglycerides) that up your chance of developing heart disease, stroke, and diabetes. 7. Bonus: You might excel at work.